This week I tried to keep the number of featured apps brief. On the iPhone front we had a couple of very different freebies. Craneballs Studios released Overkill, a freemium 2D shooter with loads of weapons/level, that will keep you busy for quite some time. Lima Sky released Doodle Jump: HOP The Movie, a version of the amazingly popular game Doodle Jump branded for the upcoming Universal Studios family film HOP The Movie. Fans of the classic arcade game Tapper should definitely check out Warner Bros. and Square One’s beautifully “rebooted” version of the game on either their iPhone or iPad. For the kids we have Helicopter Taxi, the first of two debut releases from new Swedish Game Studio Toca Boca who’s focus on creating apps for kids that help foster imaginative play. 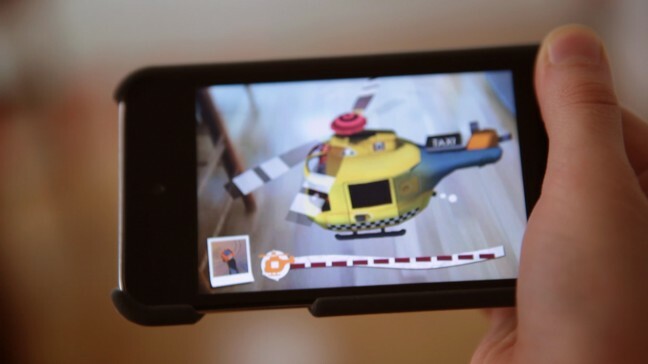 Helecopter Taxi is a helicopter simulator for the iPhone that utilizes the camera and augmented reality to let your kids fly around their bedroom while performing rescue missions. Finally, Gameloft brings the popular Tom Clancy’s Rainbow Six® FPS game series to iOS with Tom Clancy’s Rainbow Six®: Shadow Vanguard. iPad owners get native resolution versions of several popular iPhone titles including Big Blue Bubble’s puzzler Burn The Rope, Disney’s death-racer Split/Second, Minoraxis’ Fruit Juice Tycoon 2 (the second title in their Fruit Juice Tycoon time management game series) and Pixelocity Software’s insanely addictive asynchronous racer Disc Drivin’. Endloop released Chicken Balls HD, their buzz-worthy Angry Birds meets Peggle meets Pinball meets Pachinko physics-based puzzle game. Finally, Toca Boca’s second debut title of the week, Toca Tea Party turns your iPad into a table for your little girl’s very own no-mess tea party, complete with all the cups, saucers and tea her dolls and stuffed animals can drink. As always, please leave a comment below letting us know what new releases you picked up this week.